It sounds crazy, but I'll never be the same. What's the opposite of a morning person? Me. I'm the type of person who wakes up and snoozes my alarm at least five times before even considering rolling out from under the covers. Yet, for the past month or so, I've been excited about getting up pretty much every morning, thanks to ... a breakfast sandwich maker. Also available at Target, Walmart, and Bed Bath & Beyond. Imagine waking up to the prospect of a warm, delicious, homemade bacon, egg and cheese sandwich every morning with minimal effort. That's my life now. And it's great. This bright red kitchen device — with a smaller footprint than the size of my hand — has completely transformed my mornings. First thing's first: If you want to put some sort of meat in your breakfast sandwiches (bacon, ham, sausage), I recommend cooking a batch ahead of time. I usually just stick a sheet pan with some bacon in the oven for 15 minutes on Sunday nights and I'm set for the week. Then, to use it in the morning, you plug in the device and it automatically starts to heat up. I'm not sure how long it takes because I usually plug it in and walk away to get changed or brush my teeth, but it can't be more than 5 minutes. Then, you open up the machine, and put the bottom half of an English muffin in the bottom compartment, along with any cheese you want. You can also put your bacon in the bottom, but I tend to put the bacon in later because I prefer it separated from the cheese. Then, you bring down the divider between the middle and the top compartment and crack an egg into it. If it's already heated, the egg will start cooking right away and won't spill. The first time I did it, I didn't read the instructions and cracked an egg in there without preheating the breakfast maker. Mistake! It spilled all over my counter. Since that first time, though, I haven't had an issue. Then, after cracking an egg in there, you close the top compartment and let it cook for a while. About halfway through I add my salt, pepper and hot sauce, and walk away again to keep getting ready — usually blowing out my hair with the Revlon blow drying brush. By the time I come back, maybe 5 minutes later, the egg is cooked through. 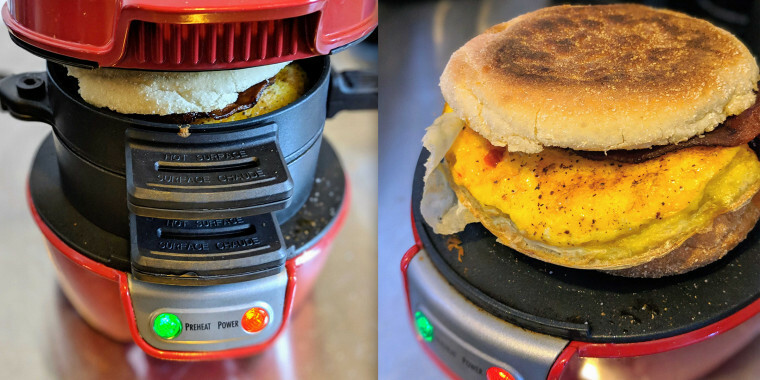 Then, I add the bacon and the top half of the English muffin, close the machine, slide out the divider that separates the egg from the bottom of the english muffin and voila: I have a perfect breakfast sandwich. "FAM. I need you to lissssssen. I would give this product 87 stars if I could. This thing was delivered to my doorstep in two business days, and will provide a lifetime of joy for me. You'd think it would be one of those gimmicky kitchen appliances that barely even works. EXCEPT you're wrong. It's amazing. It's quick. Look. Lissssen. You put the ingredients in and about two minutes later your tummy is all like 'oh yesssss.' Basically. Just buy it. Purchase the sammich maker. You're welcome," — Amazon Customer. That review peaked my curiosity, but there was no chance I was spending my hard-earned money on this thing. Then, when my aunt asked me what I wanted for Christmas, and I couldn't think of anything on the spot, I sent her this link, semi-jokingly. And, she bought it! Now, I feel like I can't live without it. I can already imagine your eyes rolling as you read this, but I'm telling you: It has transformed my mornings and saved me money. Now I rarely purchase breakfast sandwiches from a coffee shop. And, I buy the English muffins, bacon and eggs in bulk. So, my breakfast sandwiches cost maybe $1 each. Now, I re-read the Amazon review above and completely agree. 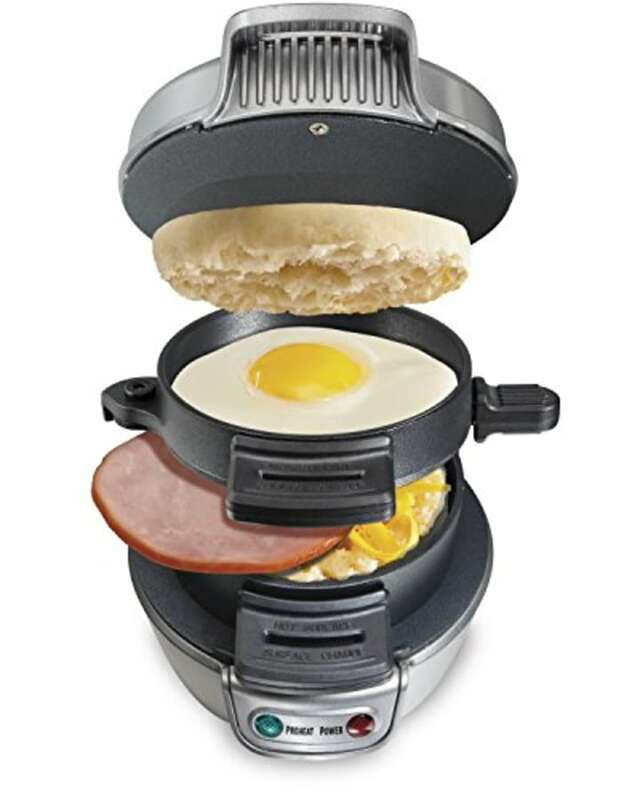 Mornings are trash, unless you have this amazing sandwich maker. Thank you for coming to my TED Talk.